This is Durham Wildlife Trust's largest nature reserve. The most important features of the site are the large areas of heathland and the rough grassland which provides breeding habitat for waders. The Trust wanted a statistically sound monitoring scheme that was compatible with the 'indicators of success' used in the Higher Level Stewardship agreement. We started working on the scheme in 2012 and did some additional surveying in 2013 and 2014. Making the new monitoring scheme compatible with the HLS indicators of success was complicated, as the indicators of success involve several different targets, none of which were designed with statistical anaysis in mind. Most of the heathland areas were dominated by mature heather and so for that reason these habitat parcels did not reach their targets. This information now helps the Trust decide how to adjust its management so that more diverse habitat conditions can be encouraged. Gowk Bank is a very interesting NNR in a remote location by the River Irthing. It has some very species-rich damp, upland hay meadow vegetation (M26b) supporting a big population of the rare montane eyebright Euphrasia officinalis monticola. There are also drier upland hay meadow vegetation types on the site including MG3c on a steep bank and flowery MG6b in the river flood plain. A monitoring scheme, based on 10 permanently-marked quadrats started in 1985 and was repeated eight times at irregular intervals up to 2002. We were asked to re-survey these 10 quadrats in 2012 and analyse the results. The 10 quadrats were placed in areas with four different vegetation types and initially I was worried that this sample would be far too small to give data that would allow us to come to any firm conclusions. But permanently-marked quadrats allow us to use more powerful tests based on 'matched pairs'. The results included more statistically significant differences than I had original expected. 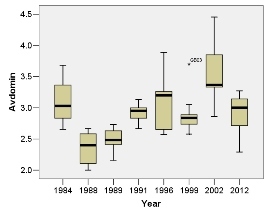 There was strong evidence showing a decline in species-richness early on in the monitoring, followed by a gradual recovery later on. We did some initial investigations on possible causes for the changes by calculating various ecological indices for each quadrat from each survey. The matrix scatterplot below plots each of the four main Ellenberg index (F = wetness; L = light; N = fertility; R = reaction (pH)) scores from all quadrats against each other. 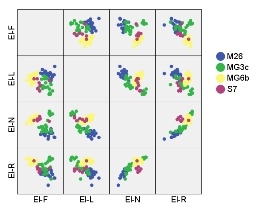 Quadrats from the four vegetation types are mostly clumped into coherent groups on the plots. The interesting M26b (blue dots) vegetation has high scores for wetness and light and low scores for fertility and reaction; i.e. it likes relatively damp, open, infertile, acid conditions. When we examined changes in average Ellenberg values there was strong evidence to suggest that conditions overall had become more favourable for plants that do well in wetter, more acid and less fertile conditions. 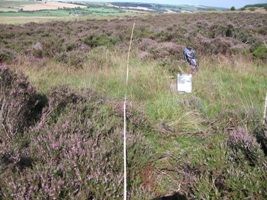 The survey methodology involved estimating %cover of each plant in each quadrat using the DOMIN scale. Different surveyors had been used in different years, so there was a chance that the method may not always have been applied in the same way. The (alarming) differences in the range and average Domin scores recorded in each year are illustrated in the plot above. In particular, the scores in 1988, 1989 and 2002 were quite different from most other years. This suggested that the method was not repeatable in a reliable way. Alternatively, differences in the timing of the survey (and how advanced the vegetation was) could account for higher or lower DOMIN scores on average. We based most of our analyses on data from 1984, 1999 and 2012. The box-and-whisker plots for these three years overlapped quite a bit and the Kruskal-Wallis test gave no evidence of significant differences between them. Practise good data management all the way through. A good question to begin with is why do we need to do statistical tests anyway? Why can't we just survey what we are interested in both times and see if the result from one survey is different to the other? Well, we could do that, but if our survey involves sampling (e.g. we do a number of quadrats, rather than surveying every square metre of the habitat) then we are never sure if the samples are truly representative of the conditions in the entire habitat. Our results may appear to be different, but this difference could just be due to random chance associated with the way we sampled. Using standard, well-established statictical tests allows us to quantify how uncertain we are that the results are not just due to chance. This allows us to be more confident about the strength (or lack of strength) of the evidence from the survey results. We can help you in designing monitoring schemes/programmes. 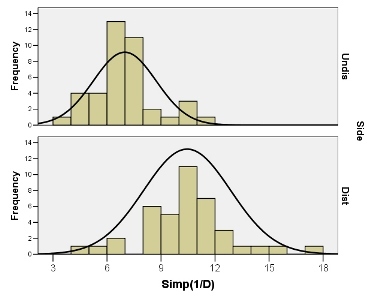 The best time to think about what type of statistical tests you will use is right at the start, as this more or less determines the types of field methodologies you should use. If you don't consider statistics at the start there is a risk that the hard work you put in doing the surveying will not end up being useful. You may either get no result or a misleading result. Avoid methods that result in lots of zero values. Relationships/Associations: e.g. is species-richness negatively associated with increased fertility on your site? Predictions: e.g. 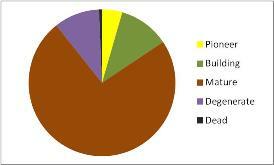 which set of factors are most important in determining how well your plant does at your site? Stanley Moss is a DWT nature reserve with degraded raised bog. The 'disturbed' side had conifers removed two years before the survey. 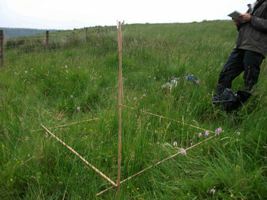 40 vegetation quadrats were surveyed on each side and Simpson's Reciprocal Index (a standard measure of species diversity) was calculated for each quadrat. This graph summarises the results. On average, the 'disturbed' side was more diverse than the 'undisturbed' side. Accepting this result uncritically could be misleading. 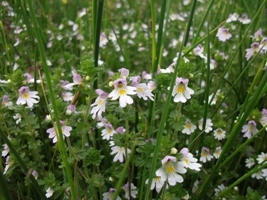 Disturbance often results in an increase in diversity as new niches are provided for 'weedy' species in addition to the species that were already present. However this tells us nothing about habitat quality. Using positive and negative indicator species we devised a 'bog quality index' and calculated a bog quality score for each quadrat. There was much more overlap between the quality scores than between the diversity scores. Both sides were different, but neither was in optimum condition. The 'undisturbed' side was mostly dominated by heather due to lack of recent management. 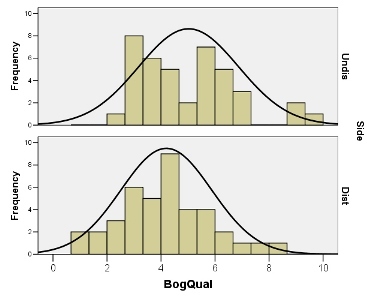 In fact, plotting diversity against bog quality, as in the graph below, shows that the two measures are more or less completely unrelated. 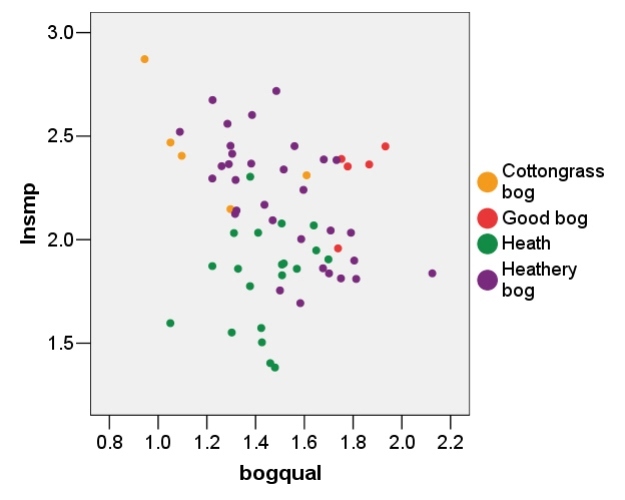 The five 'good bog' quadrats (red dots) are all in the top ten on the 'bog quality' (horizontal) scale, but they don't all score highly on the diversity (vertical scale). On the other hand, the 'cottongrass bog' (orange dots) quadrats were mostly uninteresting in terms of quality, yet several of them have high diversity scores. PTYXIS specialises in detailed botanical surveys and habitat management advice, offering affordable and reliable ecological services.